Kanye West running for president? Evidently during the 2015 VMAs Kanye West announced his candidacy for the 2020 presidential election. And all of a sudden I’ve never been more convinced to vote for Hillary in 2016. Get it? If Hillary becomes president in 2016, you know she’ll run for reelection and Kanye will be out of luck. Unless he runs as a republican? With Trump as his running mate? And Taylor Swift as his Secretary of State? Any scenario I come up with in my head makes me want Jesus to come back in 2019. Every time I see these trailers, I think of Taylor Swift for obvious reasons. The first time our professional paths crossed was in 2006 at the music video shoot for Wayne Warner and “God Bless the Children.” My guess is this video would be shot a lot differently today than it was in 2006, because Taylor wasn’t a superstar back then. Taylor’s days as an unknown audience member in a Wayne Watson music video are long gone. Her stock has skyrocketed and working at CMT, her name is heard quite often around the offices. I wonder if her worldwide popularity even affects the tractor-trailer business? 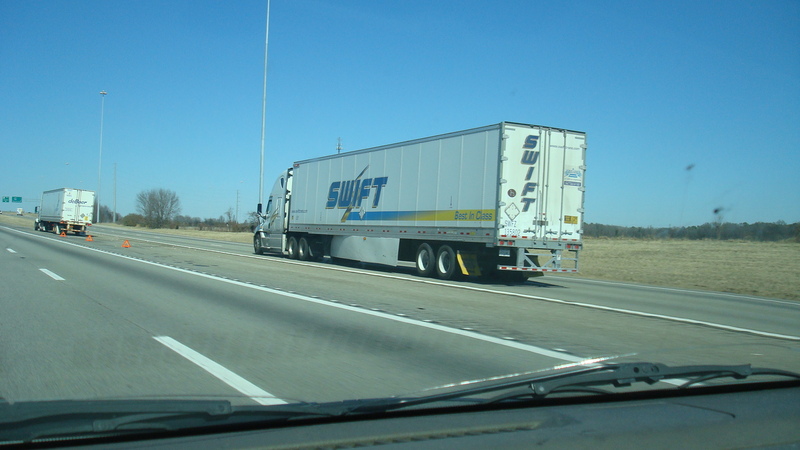 I can’t imagine having “Swift” on the side of your trailer is a bad thing. Unless you’re Harry Styles. So just being totally honest, I don’t know anyone who likes Justin Bieber or Kanye West. I mean, ANY. ONE. It’s something that’s got me curious. How and/or why are they so popular? Maybe it’s the same reason I’ll watch a Green Bay Packers game when my fantasy team is going up against Aaron Rogers. I want to see him throw a few interceptions. Justin and Kanye are two guys we want to dislike. So the more we hear about their idiotic behavior, the more satisfaction we feel. Well, when Jeopardy states, “The artist who spiraled out of control before fathering 5 kids by 6 different women and is now working at UPS part time” we’ll at least have a 50/50 shot at the right answer. If you told me a year ago that I’d be making more money than New England tight end Aaron Hernandez the last half of 2013. I’d visit a doctor and a dentist on two consecutive days. Last summer we saw dolphins jumping in the boat wake and I told my nephew it was a once in a lifetime experience. Then this summer, we saw this. What the heck do I know? That a few weeks ago, I’d toss the signature I got from Alex Rodriguez after chapel at Westminster Christian School in 8th grade, in the trash. That American Idol hasn’t thrown in the towel yet. It’s over, let it go peacefully into the night. That interns all over the country were born while Bill Clinton was in office. Wasn’t that like a few years ago?? How did this guy become famous?? That’s all I have for today.